Amazon has got the Cartier parent worried. But the online retail giant is badly dressed for success in luxury. Richemont’s hope to join Kering and LVMH in a digital fightback also risks underestimating threats posed by smaller, nimbler luxury rivals such as Burberry. 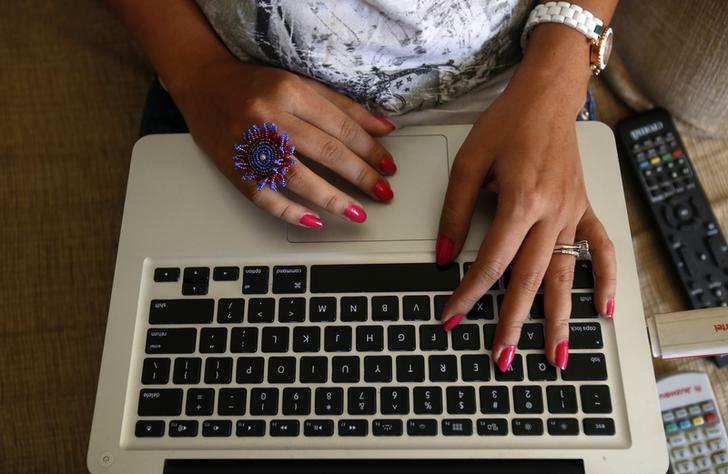 The hands of a blogger are pictured as she blogs from her living room, January 22, 2013. Johann Rupert, executive chairman of Cartier owner Richemont, said on June 8 he had invited industry rivals LVMH and Kering to invest in the newly combined Yoox/Net-a-Porter group to create a luxury website that can compete with the likes of Amazon. Rupert said: “I want to create a platform that is open to everyone, it is up to them [LVMH and Kering] now… I think it is too big a game for any company to dominate” and warned that the level of Amazon’s capital expenditure is “staggering”. Richemont agreed in March to sell its upmarket internet retailer Net-a-Porter to Italy’s Yoox in an all-share deal that created an industry leader with combined sales of 1.3 billion euros.